Beneath the trees at the north eastern edge of Thiepval Wood, this is Connaught Cemetery. 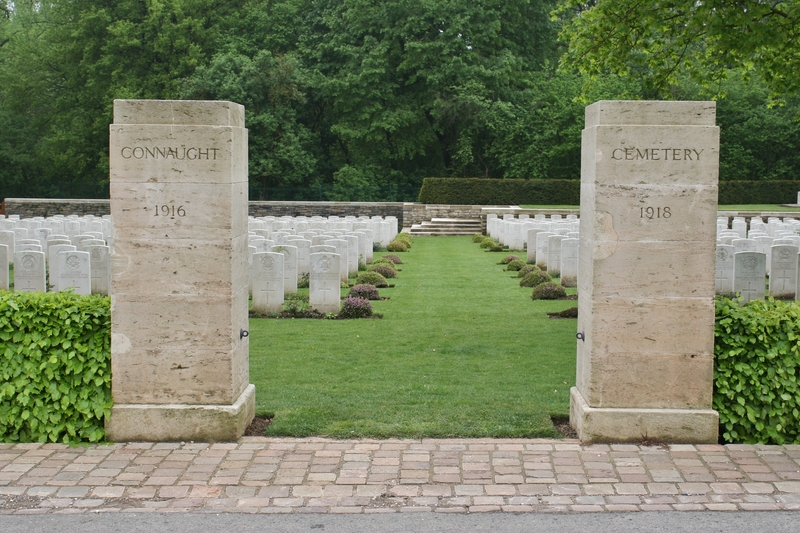 And this is one of two cemetery entrances – I reckon there’s just enough time for a brief look around. 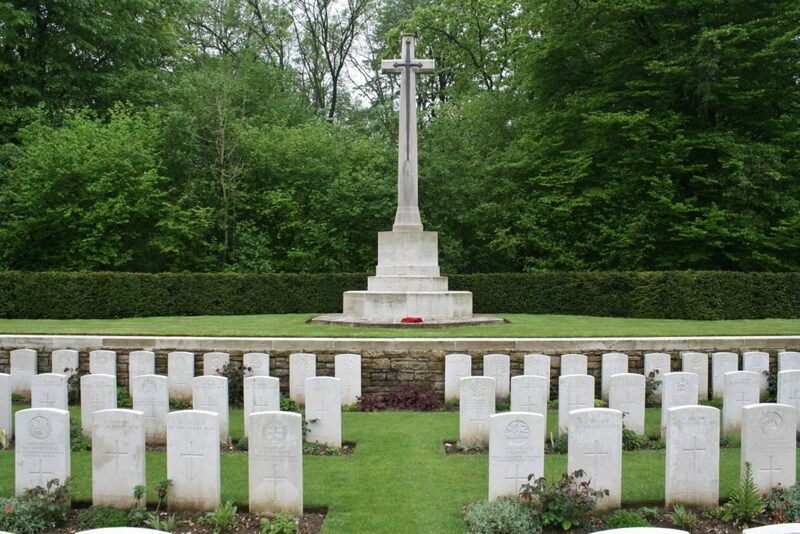 The cemetery was begun in the autumn of 1916 and by the end of the war 228 burials had been made here. 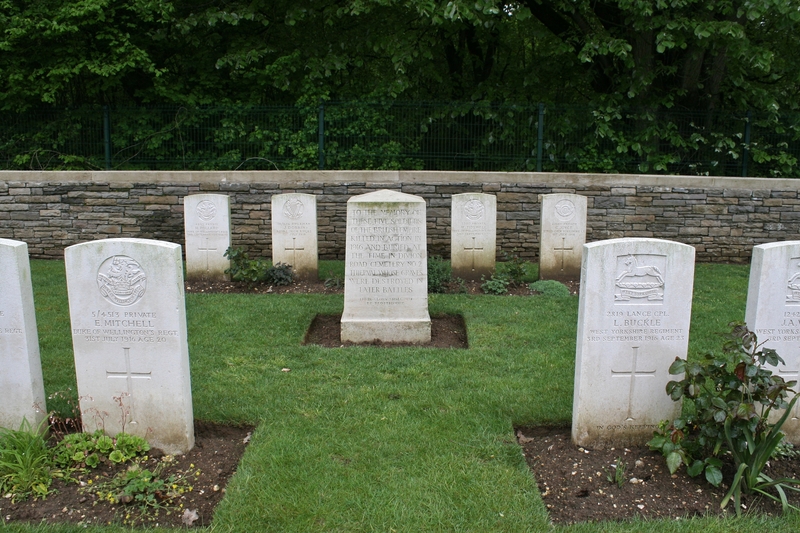 The original graves are all now directly behind the Stone of Remembrance in Plot I. 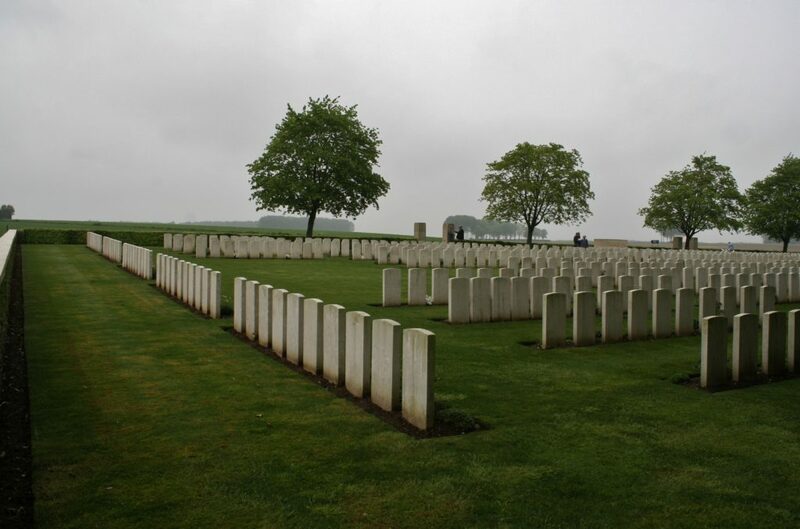 …to right, you can see how much it was increased in size post-war, as men were brought in from isolated battlefield graves and smaller cemeteries. 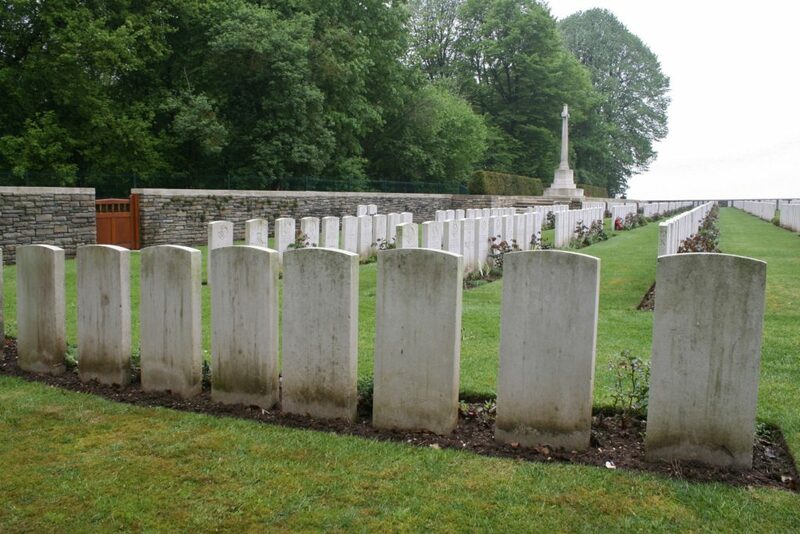 Plot I (the five rows nearest the camera). Correct me if I’m wrong, but I believe that every identified headstone legible in this picture is inscribed with just one date (click to enlarge, of course). 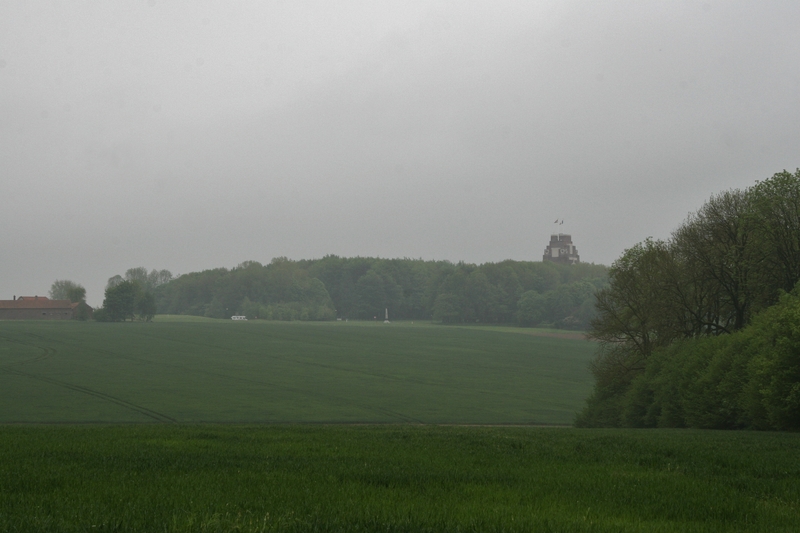 …with the Ulster Memorial Tower in the background. 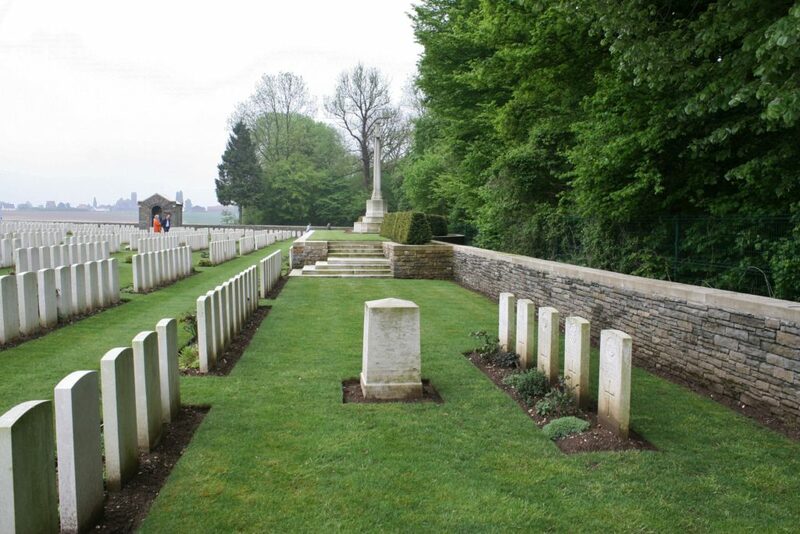 Here, courtesy of our friends at the CWGC, is the cemetery plan. 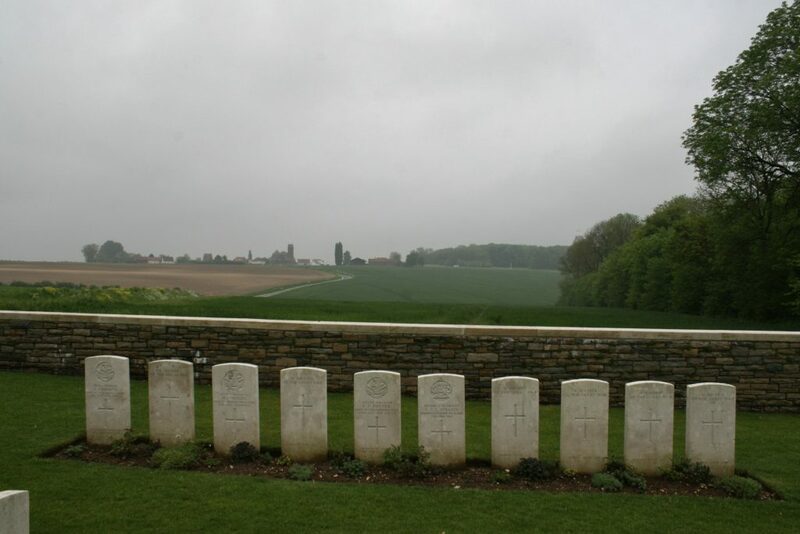 Looking east from the north west corner of the cemetery, the rear of the headstones of Plot V nearest the camera. …remember five British soldiers once buried in Divion Road Cemetery No.2. 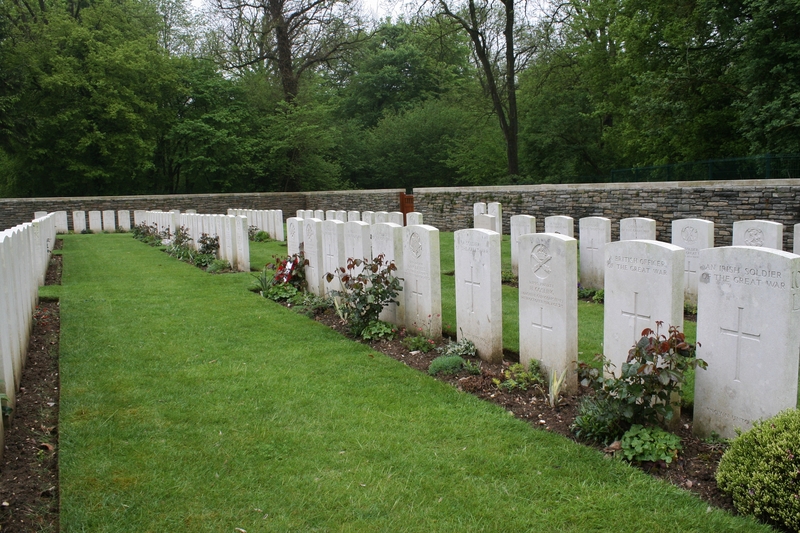 Half of the nearly 1300 burials here are unidentified. 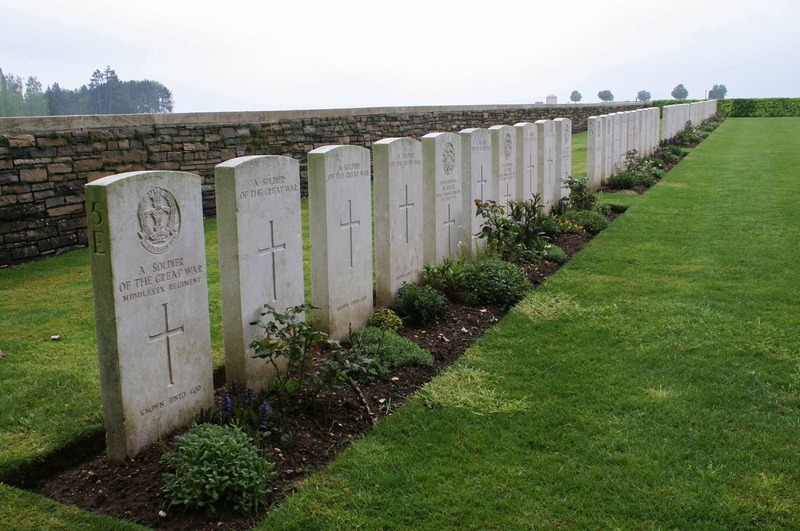 …we find two more memorials, this time to men ‘believed to be buried in this cemetery’. …split into sections of ten. …and looking east across the cemetery wall towards the Thiepval Memorial from the same position. 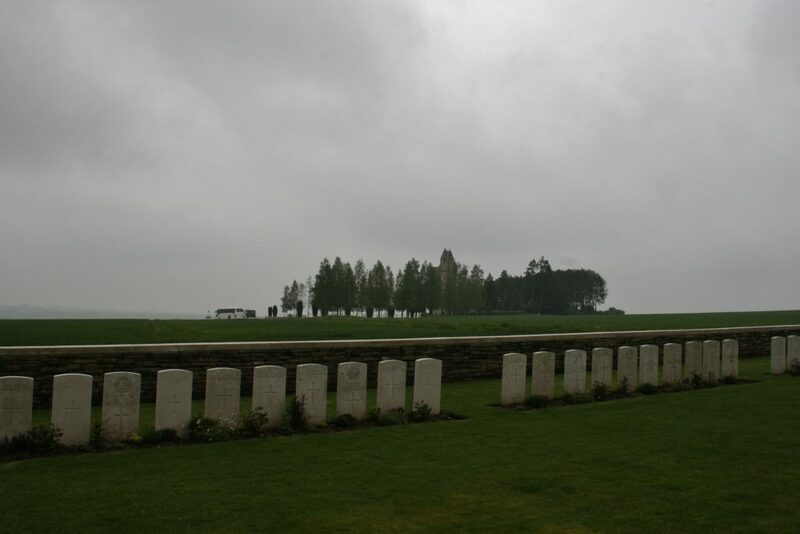 In front of the trees in the centre, you can see the 18th Division Memorial, which has caused me no end of troubles on my visits ( I still have yet to get a decent shot of it – check out the Thiepval Memorial post if you haven’t already – and it’s hardly as if it runs off and hides whenever I’m in the vicinity. Hopeless.). 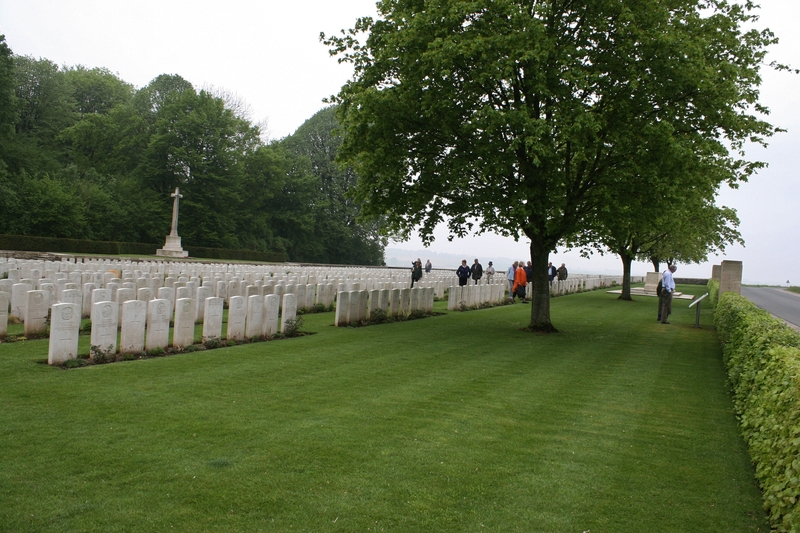 Members of another coach tour head up the track towards another cemetery beneath the trees on the horizon. I have a plan. 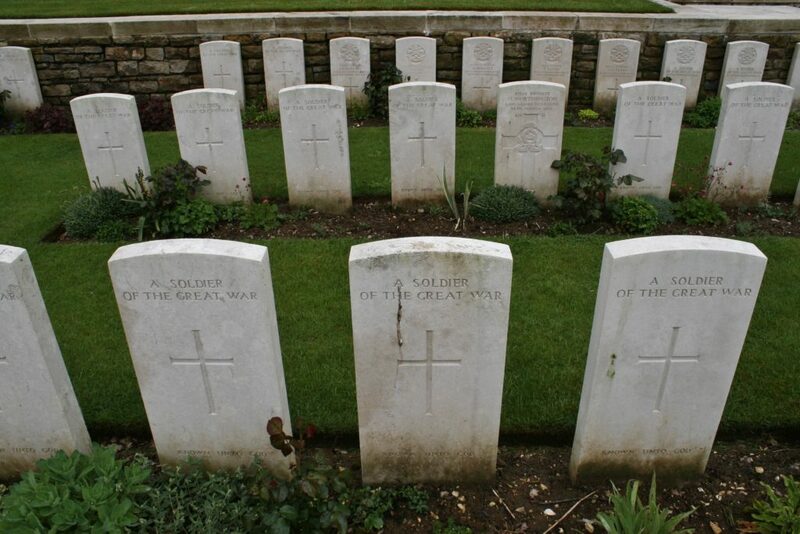 I’ve no idea where my lot are – hopefully having a cuppa at the tower – as opposed to sitting in a coach waiting for me – so I think I’d better tag along with this group – they’ll never notice – if I’m going to get a look at Mill Road Cemetery before we leave. Looking back towards Connaught Cemetery and Thiepval Wood, from the track leading to Mill Road Cemetery. 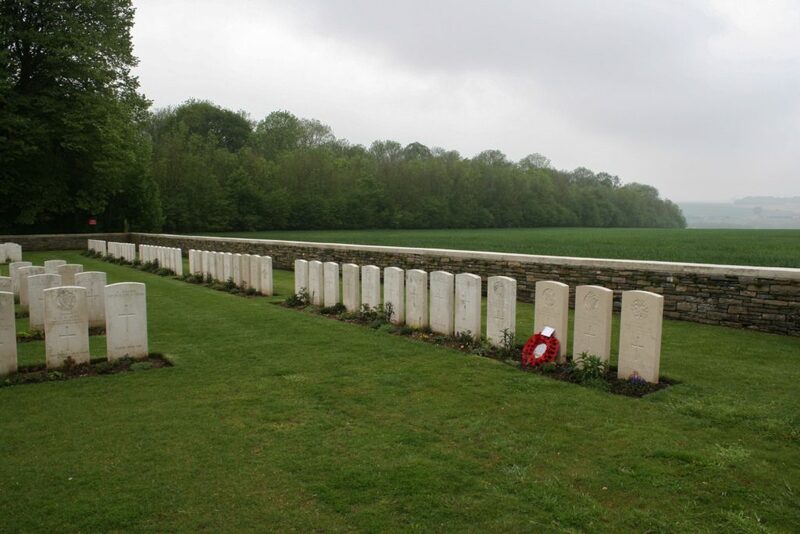 Addendum: The photo below has been added in response to a comment from June Godwin, whose Great Uncle, Private Albert Edward Green, Royal Marine Light Infantry, was killed on 5th February 1917 near here, and is buried between two of his colleagues in Plot VIII Row A. I have highlighted his headstone in orange. 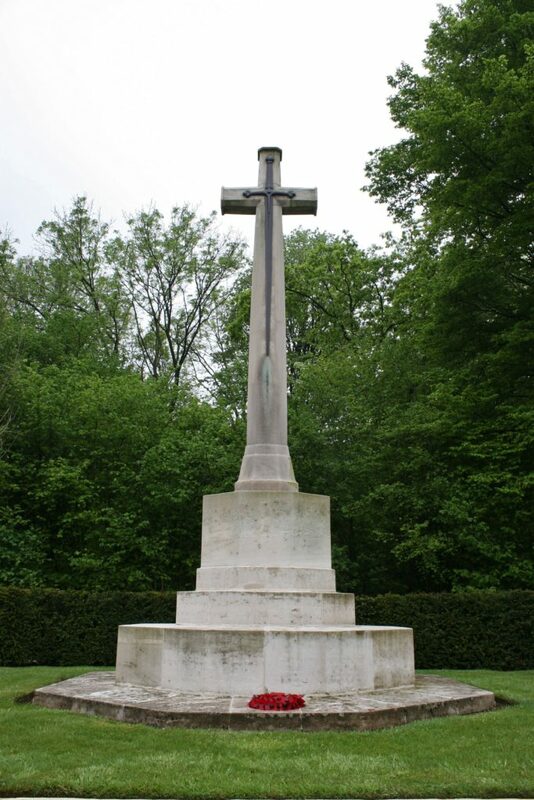 Coincidence that you posted this, and we are in Belfast on a family wedding, and we watched the Somme 100 parade through the city on Saturday morning. 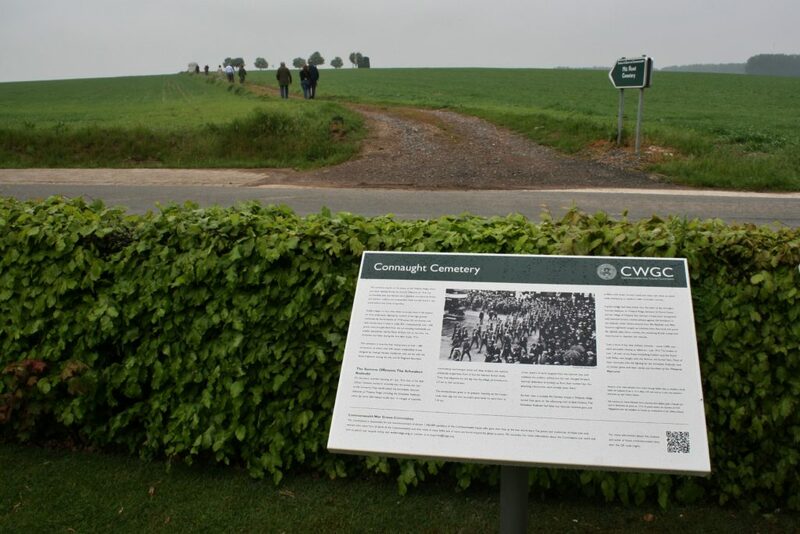 All to do with 36 Ulster division and it was a big parade. Coincidence indeed. I like that. Have just posted the other cemetery nearby, Mill Road – the 36th Division gets a mention in that, too. Hope a good weeekend is being had. Thank you for publishing these pics. 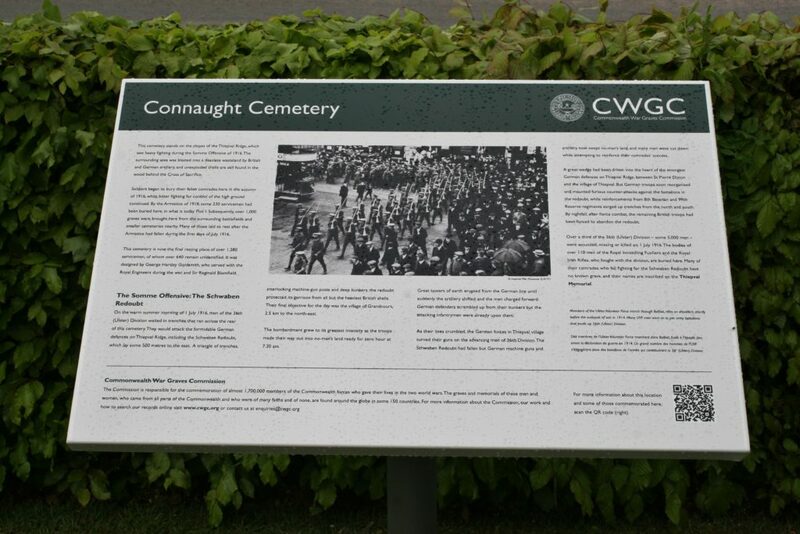 My great uncle is buried at Connaught and I kind of hoped his headstone would appear in one of them but no such luck. Yor pics have given me a real feel for the atmosphere though so thanks again. 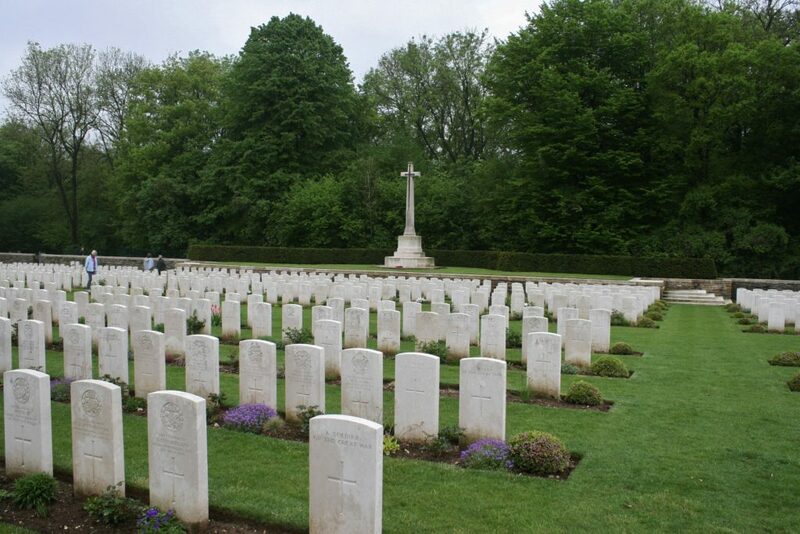 May be one day I may get over to pay my respects. You are most welcome. Glad you enjoyed the photos – I looked at them again after I read your comments and I’m glad I got the atmosphere across. You didn’t mention your Great Uncle’s name; I’m sure if you did I could point out his headstone for you in one of the above photos! Seriously. Nearly forgot. There are some other photos of Connaught Cemetery taken from a little further away at the end of the Mill Road Cemetery post (it follows the Connaught one, or use the search box). 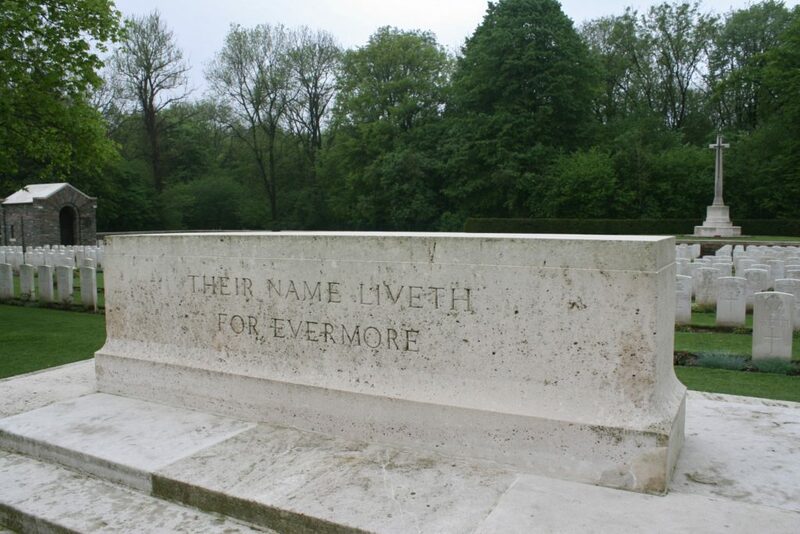 Edwin Aston, a cousin of a friend of mine, was killed 1st July 1916 and is buried here. If you come across him, please could you let me know? Thank you. Hello Mrs Dean. Thank you for commenting. 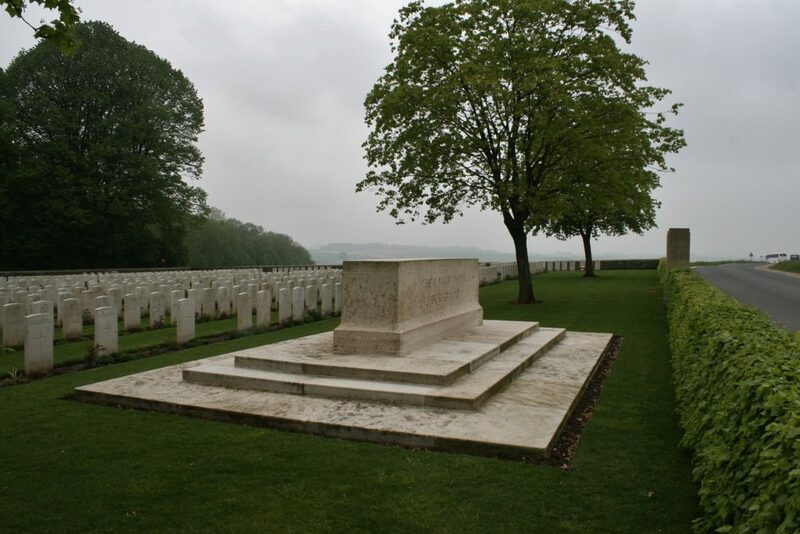 You can actually see the reverse of his headstone in the view from the north west corner of the cemetery, which you can match to the cemetery plan. my great uncle Albert Edward Green is buried here in grave 8A7 and i was wondering if you can tell me whereabouts that is . Hello June. 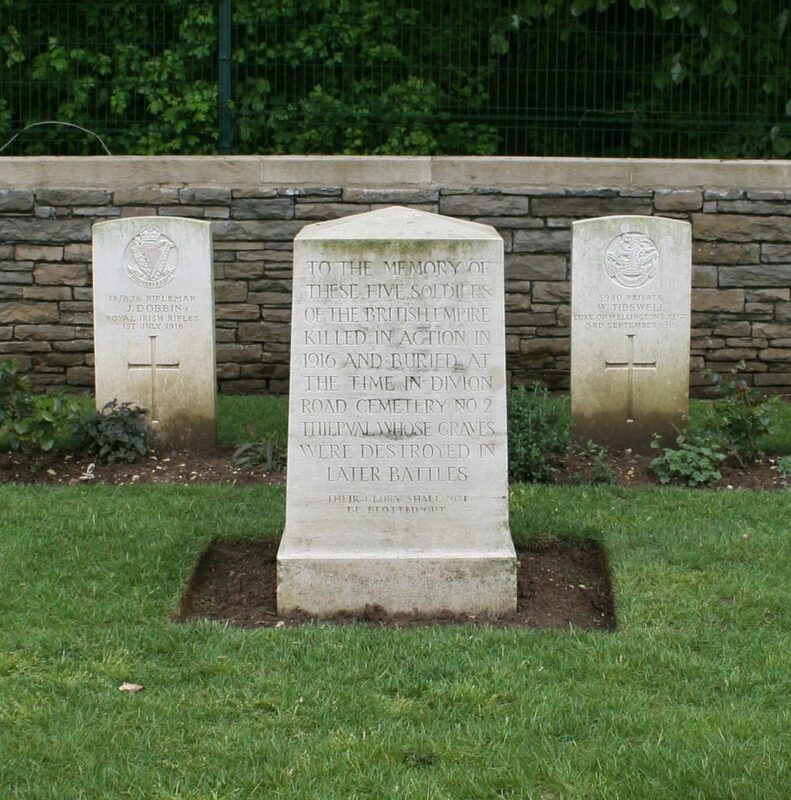 Thanks for asking your question, and as we aim to please, I have added a photograph to the end of the post where I have highlighted your Great Uncle’s headstone. 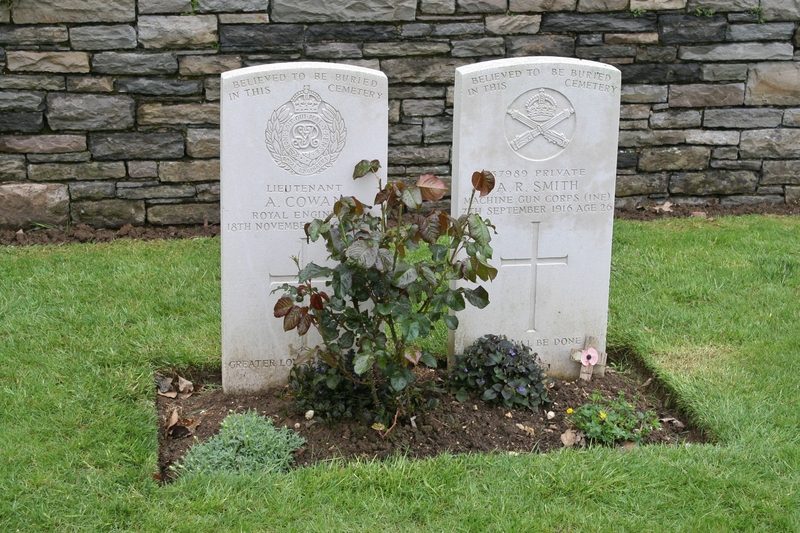 He is buried between two other RMLI men, one killed on the same day as him. I don’t have a close-up I’m afraid, but you can enlarge the photo by clicking on it. Hope that helps.